A James Cook University study shows fish retreat to deeper water to escape the heat, a finding that throws light on what to expect if predictions of ocean warming come to pass. Redthroat Emperor (Picture: Michelle Heupel). JCU scientists tagged 60 redthroat emperor fish at Heron Island in the southern Great Barrier Reef. The fish were equipped with transmitters that identified them individually and signaled their depth to an array of receivers around the island. The experiment monitored fish for up to a year and found they were less likely to be found on the reef slope on warmer days. It’s thought the species head for deeper water in response to warmer temperatures. The research team considered temperature, air pressure, rainfall, wind and moon phases as reasons for the shift, but discovered the only significant correlation was with temperature – the redthroat emperor were consistently monitored when water was less than 24 degrees Celsius. Lead researcher, Dr Leanne Currey said most studies looked at the effect ocean warming would have on fish biology, not on how they would distribute themselves to compensate for higher temperatures. “This is a commercially important fish and we are looking at a significant depth shift,” she said. 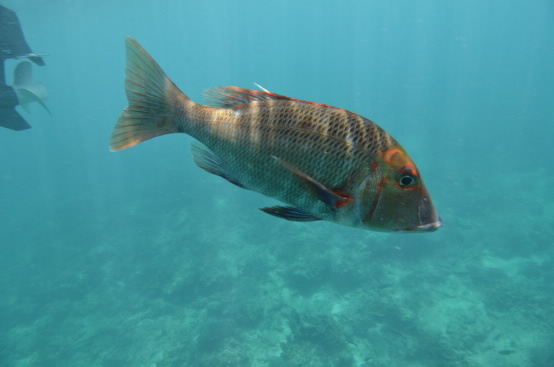 Dr Currey said the species is caught by commercial and recreational anglers near coral reefs, and is the second most favoured fish, behind the coral trout. “If it’s not around in the shallows in the future then fishers will have to redirect their efforts and it may be significantly harder to catch them,” she said. The fish has been known to tolerate depths of up to 160 metres. Dr Currey said instead of diving deeper, the species may instead shift south in search of cooler water at the same depth. She said some redthroat emperor had recently been caught off Perth, far from their normal habitat further up the West Australian coast. She said the next phase of the research was to investigate whether the fish could adapt physiologically to warmer sea temperatures, as it appeared other species could.